Can WALL-E Win Best Picture? The tummelers of Madagascar, which earned $533 million worldwide for DreamWorks in 2005, are back (along with the director-writers Eric Darnell and Tom McGrath) in Madagascar: Escape 2 Africa, which is the surest money-getter this year short of an email to Obama supporters. 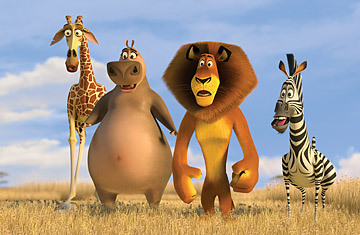 The first film sent four denizens of New York City's Central Park Zoo  Alex the lion (Ben Stiller), Marty the zebra (Chris Rock), Gloria the hippo (Jada Pinkett Smith) and Melman the giraffe (David Schwimmer)  across several seas to an island off Africa. Madagascar was Oz with even more monkeys. It was smart, sitcommy and nicely congested. The sequel is more of the agreeable, strenuous same. This time, each of the four leads gets his or her own plot. Reunited with his parents, Alex runs into a domestic bramble straight out of The Lion King: his father (voiced by the late Bernie Mac, whose Soul Men also opened today) is being challenged by the devious, Scar-like Makunga (Alec Baldwin). Manhattanite Alex must take the maturing journey from friendly stranger to source of family humiliation and finally to community savior  the Yankee of the pride. (The basic conceit, of an animal reared in showbiz captivity and forced to use his inappropriate skills to survive on the outside, will also be on display in the Disney cartoon Bolt, opening in two weeks.) Marty finds that he looks exactly like all the other zebras on the veldt, or at least he does to Alex  a critique of racial stereotyping that the movie doesn't push too hard. Gloria flirts with a studly hippo (voiced by a Barry White-esque Will.I.Am, who also provides a couple of sprightly songs) before surrendering to Melman's mopey, wussy devotion. These are the lessons  personal growth, ethnic solidarity, the meeting of true hearts  that Mad 2, like virtually all animated films, feels compelled to teach. Maybe that's salutary for the wee ones, but I'll bet they, and their elders, prefer the subsidiary creatures, who in the movie's better moments crowd the screen and take over, like the Preston Sturges rep company in The Miracle of Morgan's Creek and Hail the Conquering Hero  or like Scrat the Sisyphusian squirrel in the Ice Age pictures. In Mad 2 we get some penguins and a lemur, all balm to the comic spirit. Skipper, the penguin-in-chief (co-director McGrath), manages to overcome his complete cluelessness as a pilot by safely landing a plane carrying our heroes on the African savannah  "Who said penguins couldn't fly?"  all the while issuing commands to his brain-challenged underlings, one of whom gets a quick laugh trying to spit and ending up with a string of drool on his bib. Julien the lemur (Sacha Baron Cohen) is a frantic pantaloon who waves the stars on the plane back into Economy: "This is First Class. It's nothing personal. It's just that we're better than you." Toward the end of the movie he's convinced the villagers of the need for a human (actually, animal) sacrifice. Skipper and Julian are supremely confident psychotics, their vivid worlds unclouded by reality. Here's what you have to ask about scene stealers: Are they funnier than the star characters because they're not on screen as long? Alex, Marty, Gloria and Melman all have the heavy lifting of story lines; Julien and the penguins (and a couple of cranky monkeys who serve as the movie's Statler and Waldorf) have only to shake their shtick, deliver their bright lines and get off. (Also, they're smaller in stature, hence cuter.) Liberated from the burden of consciences or backstories or any recognizable feelings; they have no obligation to audiences other than to make 'em laugh. In this comedy, they're the comic relief. It's as if the main narratives are obligations and the sideshow capers are blessings. Some of the supporting players aren't so diverting, particularly a Yiddish bubbe from Yonkers who's so grating that the severe physical punishment she takes (before rising to heroine status at the end) is almost welcome. But even here the filmmakers locate some saving wit. When she and her lethal purse are in a showdown with a jungle beast, on the soundtrack we hear Ennio Morricone's theme from The Good, the Bad and the Ugly, but played by a Klezmer band. That's the peril and pleasure of vaudeville movies: You've got to stay alert for the next deranged, privileged moment.